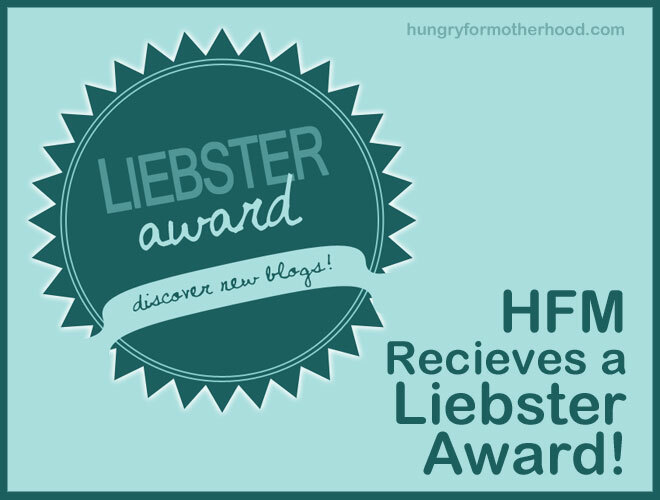 HFM Receives A Liebster Award! WOOT! This is the first time HFM has ever been nominated for an award. Nifty! Thanks so much to Journey For My Baby for the nomination. So, as I understand it, this award is given from one blogger to another. There’s no backing organization that shifts through multiple entries looking for the most deserving blog. However, one of the criteria that comes up again and again (in my five minutes of Google research) is that this is an award for up and coming bloggers with less than 200 followers. And baby, you better believe we have less than 200 folks following this little ole blog. I also found out that Liebster is a German word meaning dearest. How sweet!!!! I feel like I’ve been welcomed to the cool kids table of blogging. 😀 So this sort of works like a chain letter. The person who nominates you, asks a series of questions that you then answer on your own blog. And the recipient must also then nominate other fellow bloggers. JFMB: Where is your favorite vacation spot and why? HFM: My favorite vacation to date was in Branson, MO. My then-boyfriend and now-husband and I rented a cabin with his mother at Lilleys’ Landing. We’d wake up at four in the morning and fish for German brown and rainbow trout on Lake Taneycomo. After catching a couple of fish and cleaning them, we’d go back to bed for a while. Head into town for lunch, shopping and touristy stuff. Come back to the cabin in the evening to eat the fish we caught that morning for dinner. Maybe swim, maybe just read on the dock, but relaxing in general was on the agenda. It’s too bad we haven’t had the time or ability to go back yet. That summer, I didn’t even catch one fish of my own! My husband caught them all. But I didn’t care. It was a great time. JFMB: Where did you meet your spouse, and how old were you? HFM: I met The Man in college when I was 19 years old. I was actually dating his friend when we first met. He was in a long-term relationship. Little did I know that we’d be married by the time I was 22. JFMB: What is your all time favorite comfort food? HFM: Mac-n-cheese, hands down. My first word, before mommy or daddy was cheese. No joke. JFMB: What is your best childhood memory? HFM: I have a vague memory of my sister and I throwing food onto each other’s plates when she was still in a high chair. It degenerated into a food fight that got us in big trouble with my mom. But in the moment, we were having a blast! I think it was spaghetti & meatballs. JFMB: It’s a beautiful sunny day, and you wake up with nothing to do on your schedule. What do you do? HFM: Fly a kite. Seriously. I have a thing about kites. I hope it’s windy on this perfect day. I usually try to do this around my birthday, but at least once a year. JFMB: How long have you been blogging and how many blogs do you follow? HFM: My first post was right before Thanksgiving in 2013. This is such a baby blog really at only 15 months old. 🙂 And I am currently following 103 WordPress blogs through my reader. However, I also follow several blogs outside of this platform. I can’t say I get to read every entry, but I try to stay on top of it. JFMB: Who has made the most positive impact on your life? Why? HFM: I’d have to give credit for that to my husband. He’s encouraged me in everything I’ve set out to do. I’ve got a lot of naysayers in my family. People who would rather not try than risk failing. I love them, but they can be real downers. So when I told my husband I was interested in bellydancing, he was behind me 100%. When I told him I was going to try to write a book, he told me to go for it and took over some of my chores so I could concentrate on it during November. And because of him, I do dance and I do write. I’m certified in my particular style of dance, and I’ve written three full length novels plus articles and other bits of fiction. Without him, I doubt I’d have ever even tried. JFMB: What is your perfect at-home weekend? HFM: I’d start each day with a big breakfast. Usually out because it’s not relaxing if I have to cook it. LOL! Maybe some of that kite flying I mentioned earlier, weather permitting. And I’d take in a matinee movie. Maybe hit the mall or some other type of light shopping. Also, naps. Because naps are awesome. JFMB: What’s your favorite genre of music? HFM: Thanks to all my belly dance exposure, I’m into world music. I like anything with a gypsy-esque vibe. Or interesting instruments from the middle east. As a teen I was really into Melissa Etheridge, Sheryl Crow, Garbage, Jewel, No Doubt and other popular bands of the time. Oh the 90s. WELCOME TO THE TRAGIC KINGDOM! JFMB: Make up your own question because I’m too lazy. Thanks! Thanks again to Journey For My Baby for the award and the questions! It was actually a lot of fun answering them. Thanks so much for being a guest, friend, and obviously tolerant reader! I’m so glad I got to reading this tonight, because I am so glad to have something nice to close a long and slightly harrowing day! I only hope to live up to the promise of your nomination! ¡Happy Blogging! from ‘The Smell of My Own Poop’! Aren’t they great?! I’d say they are my simplest, cheapest joy.